Are you someone who loves to learn more crochet techniques? If so, do you take classes on a regular basis? I absolutely LOVE to take classes (and to teach classes)! I’ll be teaching 5 crochet classes at the CGOA Conference next week in Charleston, SC. The classes I’ll be teaching next week are: Let’s Get Writing (crochet pattern writing), Playful Polish Star, Intermeshing, Intro to Irish Crochet and Simplifying Symbol Crochet. To read more about these 5 classes, check out my previous blog post. I love sharing my crochet knowledge and encouraging other crocheters in my classes! There are currently between 13 and 23 students registered for each of my classes. I can’t wait to meet my students (some I already know, but many I will meet for the first time at the conference) and interact with them! It’s so much fun (and hard work, too, but mostly fun)!!! It’s great to meet new crochet enthusiasts at the conference and in everyday life (I met one yesterday at the bank)! I hope many of you are going to attend the conference and learn more so you can make bigger, better and more challenging crochet projects! To read all about the CGOA Conference (aka: the Knit and Crochet Show), check out this overview of the conference on the CGOA website. The conference is held in conjunction with the TKGA (The Knitting Guild Association) conference, so there will be knitting classes there, too. You can read all about the whole conference, including the knitting classes, here. Oh, I almost forgot: THERE WILL BE SHOPPING, TOO (lots of luscious yarn, patterns and supplies on the show floor)! If you can’t make it to a conference to learn in person, have you taken any online crochet classes? 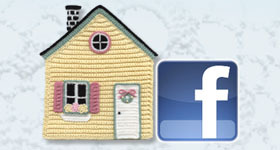 I’ve taken quite a few crochet (and knitting) classes online. I love the ability to watch them whenever I want, to rewind and rewatch parts that I didn’t understand or got distracted while watching them, take notes in the video and ask the instructor questions. 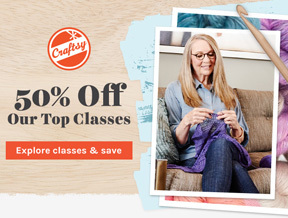 Craftsy is having a 3 day, 50% off sale on their top classes, starting today! I LOVE SALES, don’t you? You can check out their sale here. And if you’d like to narrow the list of sale classes to crochet classes, you can click on the “Yarn & Fiber Arts Classes” classification on the left-hand side of the page. This will give you the knitting, crocheting and spinning classes that are on sale. There are lots of other classes on sale, including classes on cooking, painting, quilting, and more (there’s a total of 214 classes on sale)! I hope you’ll explore ways to learn more crochet techniques and improve your skills. It’s wonderful to be able to read crochet patterns, read symbol crochet charts, learn new crochet stitches or techniques, etc. I can’t imagine crocheting without this knowledge! It really opens up a whole new world of crocheting possibilities! This entry was posted in CGOA, Crochet classes, Crochet videos and tagged CGOA, classes, crochet video. Bookmark the permalink.